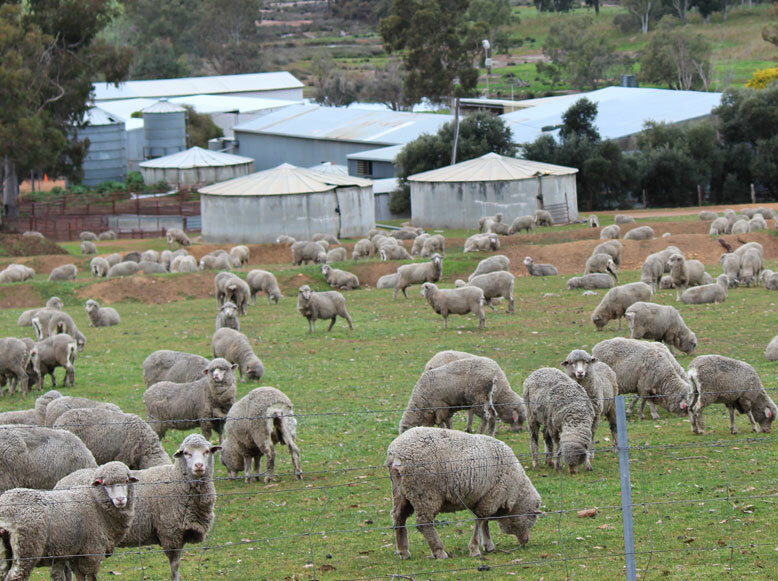 Lynford Farms livestock operation revolves primarily around the rearing and genetic improvement of dual purpose merino sheep. They produce fine 19 micron wool and premium quality prime lambs. Only sheep with good wool and fast maturing traits are kept. All ewes are assessed at hogget shearing using benchmarks for wool, ewe muscle depth and yearling weight. Shearing is conducted at various times of the year utilising our 3 shearing sheds. The main shearing occurs at the end of summer. The sheep flock is predominantly mature Merino ewes. Approximately half these ewes are our self replacing flock and are mated to Merino rams bred in our own stud flock. Their ewe lambs are reared and those with the best characteristics are retained for inclusion in our breeding flock. The remainder of the ewes are mated to English breed rams for the rearing of prime lamb. Poll Dorsett and White Suffolk rams are sourced from local breeders and are selected using Australian Sheep Breeding Values (ASBV) for their breeding qualities and for the excellent meat quality of their progeny. Once weaned from their mothers, these lambs are grown out throughout the year on green pastures. During drier months they graze on specially developed fodder crops in low-lying areas and are supplementary feed with cereal grains grown on the property. Wether lambs and the culled ewe lambs reared from the self replacing flock are grown out on our pastures and summer stubbles. At their prime they are sold as lamb or hogget to domestic and overseas markets. Our stud flock contains the best of our mature ewes. They are mated using genetics sourced from elite rams based on ASBV rankings which are normally in the top 1% of the Merino Select DP+ index. These genetics improve the wool production and meat qualities of our flock. They are passed down from the best of their progeny such that the flock rams we produce from our stud generally rank in the top 5% of the Sheep Genetics Australia database. Some parts of our land are better suited for the rearing of cattle so we also manage a herd of beef cattle to graze these areas. We no longer breed cattle but young cattle are backgrounded for intensive feeding when market conditions are favourable. All livestock are marked with electronic tags which enable us to track their individual production performance, movements, veterinary treatments and in some instances their family tree.